Okinawa—simply saying the name has so many connotations. The island itself is huge, and yet it’s an oceanic island far from the Asian continent. It takes two and half hours to fly from Hong Kong, the closest point on mainland China, to get here. Japan has a plethora of Pacific Ocean islands that are unknown to the world. There are three main sets of islands south of Kyushu: the Nansei Islands, the Sakishima Islands and the Yaeyama Islands. Okinawa’s history is prevalent. Okinawa itself has scores of islands around what the locals euphemistically call the mainland. Originally called the Ryukyu Kingdom and independent from Japan, the islands were brought under Japanese control before WWII. The second World War has indescribably shaped Okinawa ever since. The American forces needed an island with which to bomb Tokyo, and so took Iwo Jima and Okinawa Jima. The battles were long and bloody and explain the total devastation of Naha. The United States then went on to rule Okinawa until well after my own birthday in 1971. In the early 1970s, Okinawa had a referendum in which the Okinawans were given the choice of reverting to the Ryuku Kingdom and independence, joining Japan or becoming a U.S. protectorate. The vote was precariously close with many voting to remain with the United States. To this day, some Okinawans grumble about the authenticity of the vote. In 1973, the islands were handed over to Japan, and the whole of Okinawa with ancillary islands became a prefecture of Japan. Regardless of administrative power, the United States kept their military bases and thousands of personnel on the islands. In 1990, a young U.S. Marine called Doug Bennett was posted to Okinawa. He liked the people, and he liked the diving. When he tired of protecting his nation’s interests in Africa and Japan, he returned to Okinawa in 1995 and opened a new dive operation called Reef Encounters. Doug’s center became a ground-breaking business. Japanese dive centres cater mainly to Japanese clients. They dive the Japanese style, with 30-minute, highly rigid guided dives. We arrived in Naha Airport on a blustery day. Doug’s youngest instructor, Daisuke, arrived to collect us. As we drove up north to Chatan, he briefed us on his surprisingly very positive take on Okinawa and the United States. Our hotel was more like a motel in that the reception was tiny but the rooms huge. They were very American in their make up, with kitchenettes, microwave, bedrooms, lounges, and TV’s. “This used to be U.S. officers’ accommodation for Kadena Airbase,” Doug later told me. The next morning, we arrived at the dive centre very late. Huffing and puffing, lugging our cold water gear, we had misjudged the distance from the hotel. Daisuke was amused and not bothered. Sunabe Sea Wall. We loaded the Reef Encounters minibus with our kit and tanks and drove back to our hotel. We kitted up and climbed over the sea defence wall and walked over the reef top to drop in. This was weird—we were diving off a road, on the exact same place where the U.S. forces had landed on the island. The reef started just below the surface of the water. We entered by lying on our backs and paddling a few metres until we reached the edge of a long “cut” or channel that was about ten metres deep. We descended to eight metres and started to move along the sandy bottom. I gasped. The water was a chilly 21°C. I had no name 5mm Cambodian wetsuit combination that I had picked up in Istanbul on the cheap. It was good enough—my hood did its job, and I felt okay. The cold water seeped up my legs and arms, but 20-21°C was not cold enough to make it unpleasant. I twisted the bezel on my momentum dive watch. At least I did not have to wear gloves, I thought to myself. In order to access the deeper water, we had to swim out through the cut. This was not at all onerous, as the walls were paced with hard and soft coral and abounded with fish. Daisuke tried to gather us together and lead us out, but I was mesmerised by some nudibranches and had my Olumpus OMD snapping away happily. Doug had briefed Daisuke well, and he gave me the leeway a photographer so craves. A highly venomous sea snake came by, and to my consternation, found me mesmerising. It played below me and then swirled around my legs giving me some excellent photo opportunities, but doing nothing for my air consumption! Eventually it left me in peace, and went off to play with some other hapless diver. The experience while disconcerting was quite unique. Eventually, Daisuke managed to herd us out of the cut, and we popped out and turned right. Okinawa is famous amongst the knowledgeable diving community for its macro life. I was expecting the scores of nudibranches and tube worms that we did see, but I found myself astounded by the marine life. Schools of small jacks and fusiliers sped by. The visibility has been promised to be ten metres, but even on this grey day, I could see 20m. 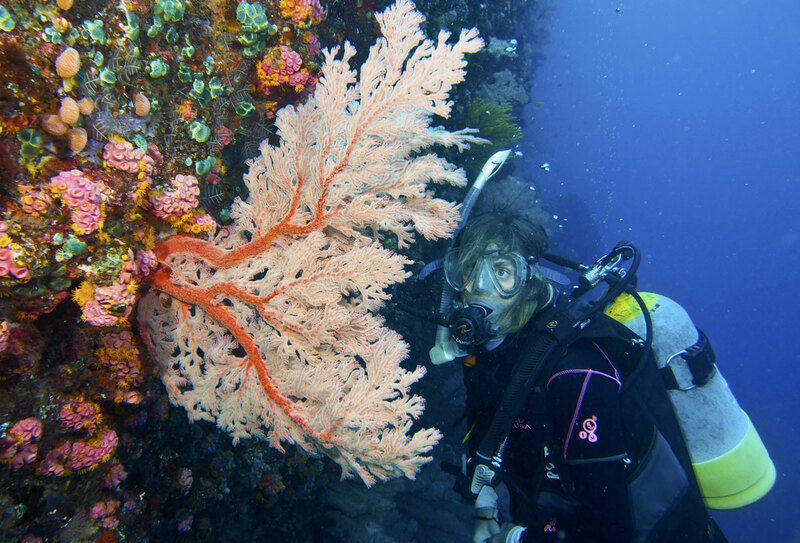 The soft coral was as exquisite and colourful as any in southeast Asia. It waved gently in the sea action, as we swam by. The end of the cut made a natural north-south facing wall, but spurs of reef stuck out to sea in an easterly direction. These made for long shallow walls that started at 10m depth and went down to 20m. Daisuke now came into his own. He knew exactly where we were, took us along the reef spurs into deeper and deeper water. Then we headed off into the blue to find a coral bommie packed with anthias, nudibranches, moray eels, and “critters various”. My air was not doing well with the excitement and the photography. I signalled Daisuke, and he led us back to the sea wall. We climbed out as a pair of F22 Raptors flew overhead and landed at Kadena.